Cruising estate sales can be a total crapshoot – sometimes you find a goldmine, other times nothing but junk. [John Ownby] recently found a sleek-looking old blender at such a sale and decided to take it home. 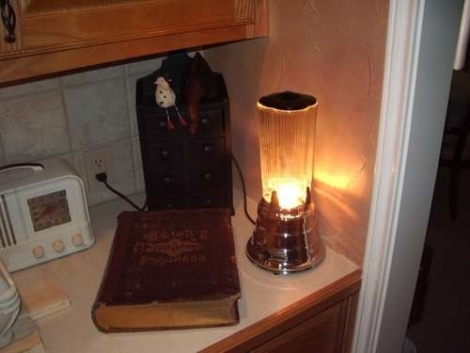 The chrome plated base and fluted glass immediately caught his eye, but he didn’t buy the blender so he could make mediocre frozen drinks – he wanted a lamp instead. The conversion was fairly simple, requiring him to gut the machine of its moving parts including the motor and blades, replacing them with a small incandescent candelabra base. While his modifications themselves are not groundbreaking, taking them a step further would make for some really cool (and functional) retro house fixtures. Indulge me for a moment, if you will, and imagine swapping out the simple incandescent bulb for some LED strips or even EL wire. Replace the blender’s cap with a small speaker, and you can use several of these together as retro-looking surround satellites. We can definitely get behind his reuse of the blender, which would have otherwise likely ended up in a landfill. It’s great to see solid, durable appliances given a second life, even in ways which were never intended. Have you rescued anything from the trash heap like [John], or do you have other ideas for your fellow hackers who might come across similar goods? Let us know in the comments.